Typically I do what I can to avoid reading spoilers for a film prior to seeing it for obvious reasons, but sometimes I truly believe knowing exactly what you are in for is for the best. I did my research with The Amazing Spider-Man 2 and read plenty of reviews, and I was prepared for the worst in regards to the complaints that seemed the most common. The thing is, I agree with most of the aspects others were upset about. The film is a mess, trying to cram so much into it with the goal of film universe building rather than telling one cohesive sequel story. The character of Max, prior to his villainous transformation into Electro, is beyond terrible, a complete and ridiculous rip off of the Riddler from Batman Forever. The major flaw of this film, however, is that it isn't so much a Spider-Man sequel as it is a Sinister Six prequel, doing whatever possible to make sure they can fast track that work to potential box office glory rather than worrying about the standalone film in front of them. Despite this, I must be honest. I really friggin' enjoyed the film. The factor that draws my admiration the most with this Spidey sequel is how Marc Webb handled the human relationships in the film. I appreciated that despite the rushed mess of trying to force in new characters and friendships, they still found the time to allow Peter and Gwen to share some fantastic moments on screen together and their chemistry is absolutely sublime, possibly due to the fact that Garfield and Stone are living out a romance in reality. Sally Field is given a chance to shine and she embraces the opportunity, with some great scenes and a touching moment or two between her and the nephew she struggles to support on her own. In these moments the film really soared. Dane Dehaan is also a great addition to the saga, although the way his character is introduced is sloppy and unconvincing. We are supposed to believe that Peter and Harry were the best of friends as children, yet in the first film this relationship must be totally inconsequential considering Peter spends so much time in the Oscorp building yet this friendship is never even mentioned, let alone explored. Still, I was glad Dehaan was there as his performance was noteworthy and I look forward to what he can bring to the Sinister Six film and future Spider-Man installments. The action sequences were entertaining but much like Zack Snyder and his absurd usage of unnecessary zoom-ins, Webb becomes too infatuated with the slow motion technique and it kills the otherwise electric pace of some intense scenes. 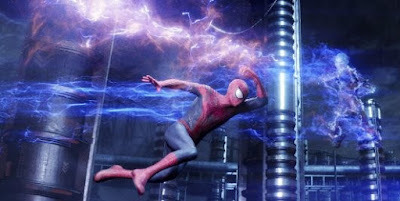 Using this once would have been fine, as it was particularly effective during a moment in which Spider-Man saves multiple people from electrocution and the slowed down method was the only way this could be demonstrated. However, it happens repeatedly throughout the film and it is overkill. The film was far from perfect, but I cannot deny I was totally invested throughout and managed to ignore the many moments of bad and focus instead on what worked for me. The Amazing Spider-Man 2 is a bit of a mess and I am sure the fact that I turned my brain off before entering the theater played in my favor, but for a Saturday afternoon with the family, looking up at a majestic IMAX screen, I can't complain.